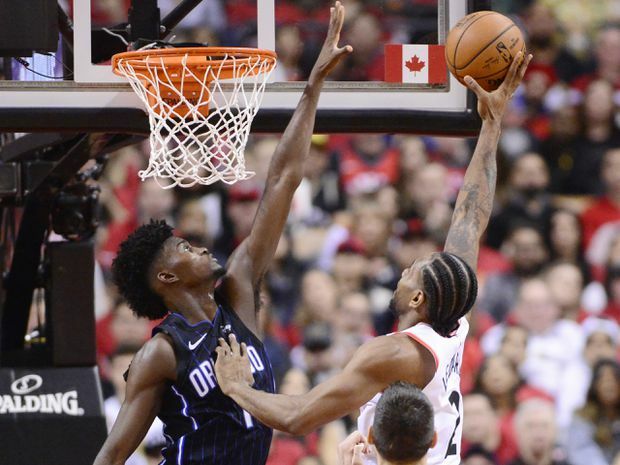 Toronto Raptors forward Kawhi Leonard (2) shoots over Orlando Magic forward Jonathan Isaac (1) during second half NBA basketball playoff action in Toronto, on Saturday, April 13, 2019. The Toronto Raptors find themselves in familiar territory – trailing 0-1 in a series they’re supposed to win. But the team is hardly hanging its head. After Saturday’s 104-101 loss to the Orlando Magic, the Raptors have a 1-5 record in the opening game of the playoffs dating to the 2013-14 season. Yet a day later, the Raps could list more things they did well than those they need to fix. They will make adjustments before Tuesday’s Game 2, but nothing crazy. The team isn’t blind to the things that led to Saturday’s loss. The players shot just 33.3 per cent from beyond the arc (they shot 37 per cent during the regular season, and an NBA-best 41.5 per cent after the all-star break). Orlando shot 48.3 per cent from deep on Saturday. Toronto coughed up leads, and made just nine free throws to Orlando’s 18. The Raptors let Magic point guard DJ Augustin get loose for 25 points. As for the defensive miscommunication between Leonard and Marc Gasol, which allowed Augustin to the hit the game-winning three-pointer, Nurse said it’s unlikely that would be repeated by two of his most experienced defenders. “It was a one-off,” Nurse said. Toronto’s own all-star point guard, Kyle Lowry, shot 0-for-7 from the field, six of them from deep. Nurse thought most of Lowry’s shots were well-created – ones he’s not likely to miss next time. But the Raps were also quick to rhyme off the long list of things they believe they did well. Toronto held Orlando to 40-per-cent shooting, while shooting 45.5 per cent themselves, and had 23 assists to Orlando’s 19. Siakam’s play on Saturday suggested an exciting post-season will unfold for him as a very dangerous scoring option. He had a career playoff-high 24 points, coming up in the final minutes on both ends, scoring, rebounding and blocking two big shots on defence. Leonard – the man with NBA final MVP experience brought to town to change Toronto’s playoff chances – was stellar in long stretches of his 25-point game. His two late dramatic buckets tied the game and then delivered the Raps the lead. He and Gasol each got in position and took well-created game-winning threes – but neither shot fell. So the Raptors feel as if they had some good plans in place.